Add an air of charm & sophistication to your backyard entertainment with an outdoor pergola. 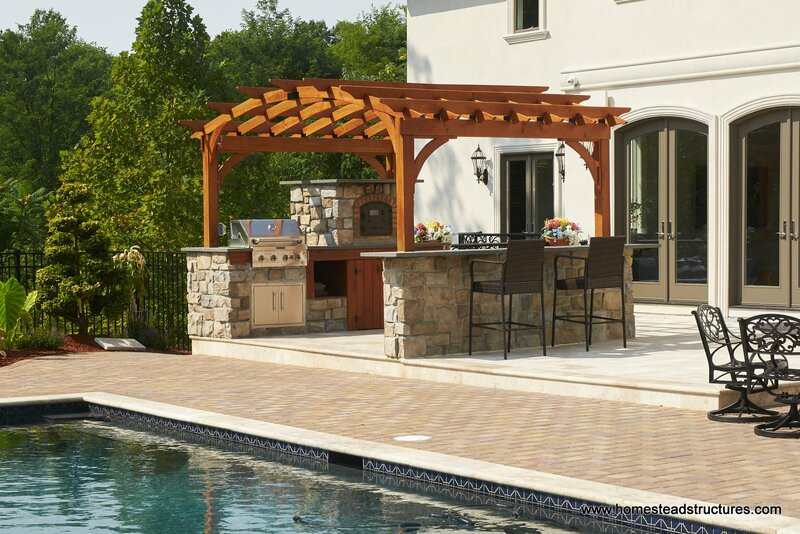 From intimate outdoor family dinners to upscale backyard BBQs with friends, a wooden or vinyl pergola makes the perfect addition to your outdoor living space. With their old-world style and charm, pergolas bring an ambience of charm, sophistication, and peace to any backyard space. Whether you're looking for a deck or patio pergola, the perfect structure for your poolside, or a garden pergola to enhance your garden areas, Homestead Structures can help design the perfect custom structure to suit your needs and style. 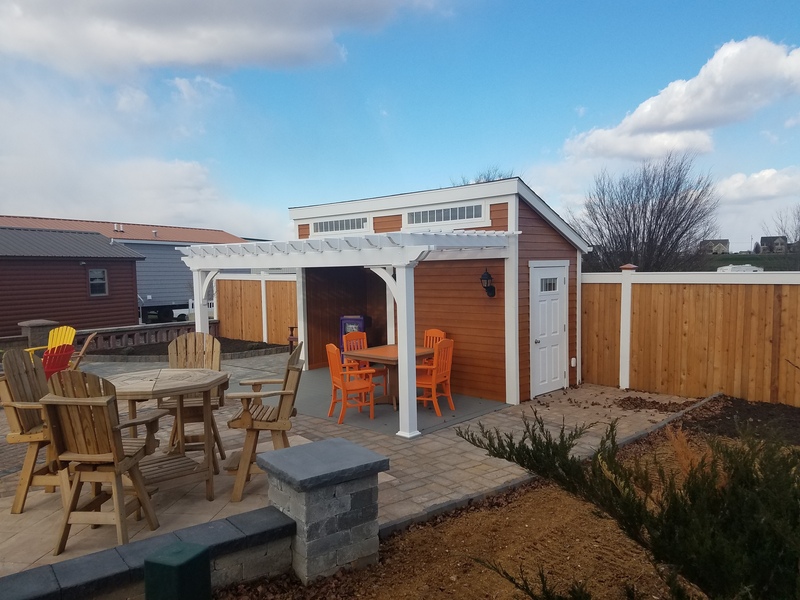 If you're ready to upgrade your outdoor space, fill out the form above to discuss pergola ideas and designs with our product specialists and receive a free project estimate! 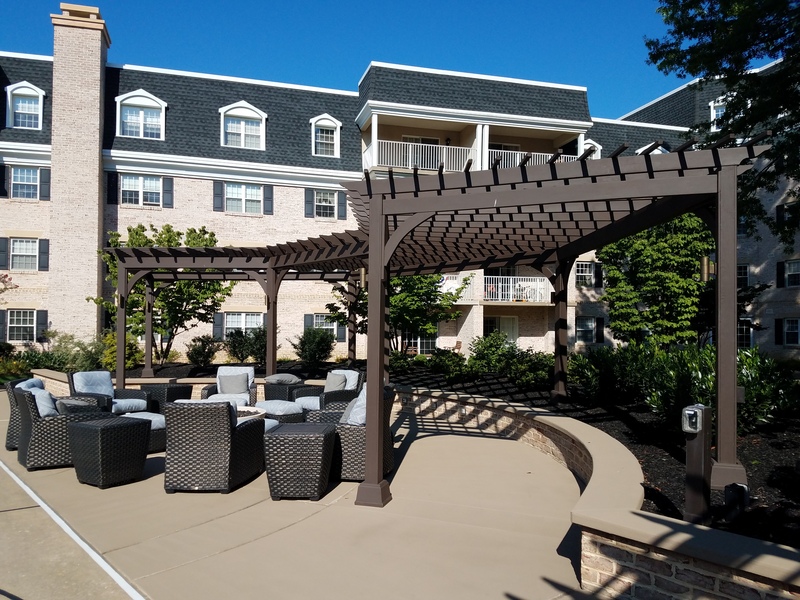 Pergolas provide just enough shade to give you a cool spot to lounge during the hottest hours of the day. They can double as arbors and trellises, allowing you to grow vine or climbing plants for an even more natural look. They add a focal point to your outdoor living space and make a perfect place for entertaining that guests won't soon forget. They can be built as an attachment to the back of the house, on a patio, or as a a free-standing structure, perhaps by the pool. Gorgeous outdoor living spaces and structures can add a lot of value to your home and property. You can easily add a pergola cover or shade to add more protection from the elements, including rain and sun. 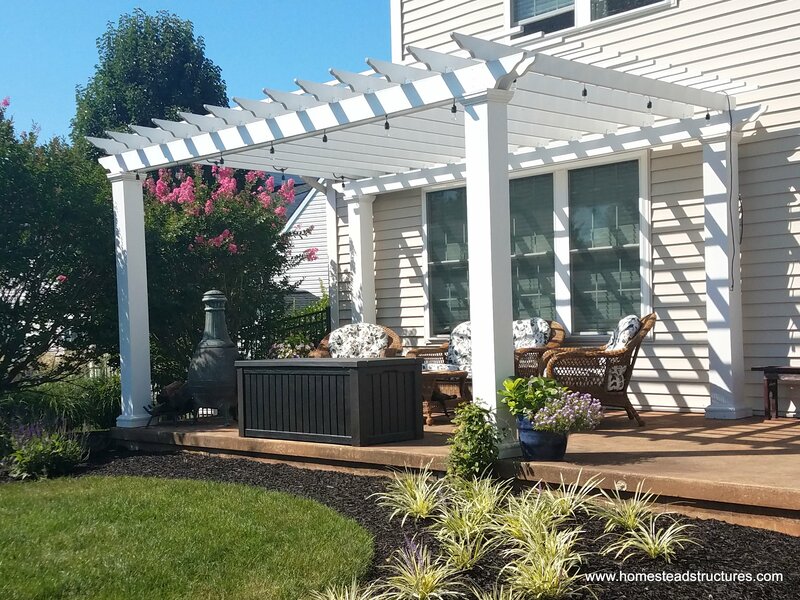 Homestead Structures is happy to provide custom pergolas to the Mid-Atlantic area, including Pennsylvania, New Jersey, New York, Maryland, and Delaware. 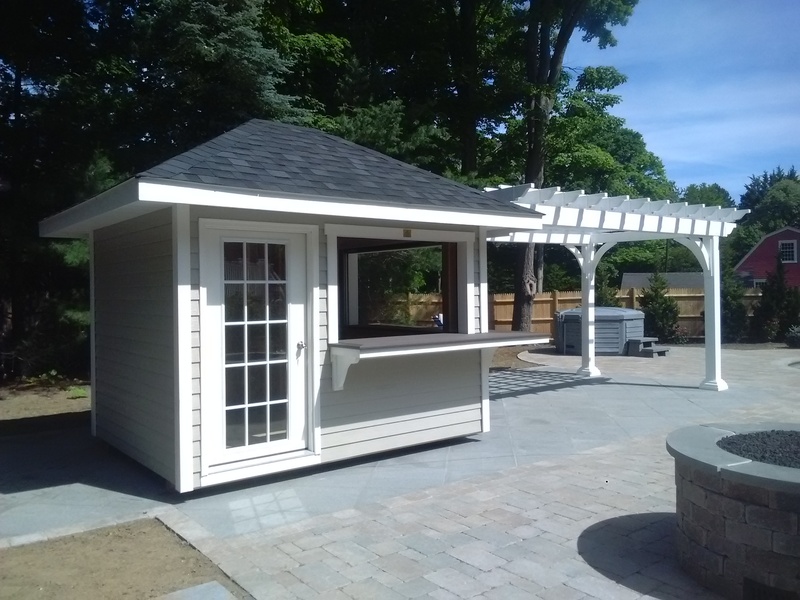 We also service MA, CT and VA, and can ship our kits anywhere in the U.S. We can build both vinyl and wooden pergolas to your specifications. Popular sizes include 8' x 8'. 8' x 10', 10' x 10', 12' x 12' and 12' x 16' pergolas. To get an idea of pergola costs and prices, give us a call at 877-272-7252 or fill out the form. If you're looking for something more shaded the can be used in all kinds of weather, you may want to check out our outdoor pavilions. Do you want an attached pergola, or a free standing pergola? Will you be placing it on a stone patio, wood deck, or in the grass or garden? Do you prefer the look of a vinyl pergola or wood pergola? If you want a wood, what type of wood - cedar, redwood, eastern pine, heavy timber, etc.? What size pergola is ideal for your space? 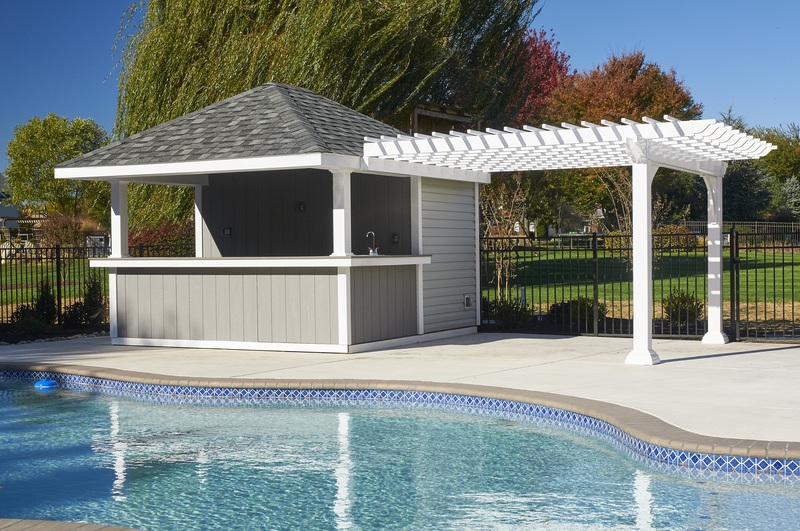 Do you wish to add a canopy, shade or roof of some type to your pergola?